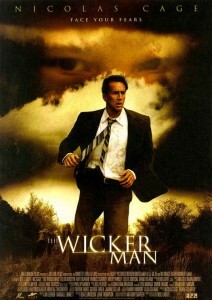 Might I start by saying I have seen the original The Wicker Man and find it highly overrated, though I can’t be bothered to muster the effort to track it down and review it here. Of course my thoughts and common sense don’t matter when possible unearned profit is concerned. So here’s the final nail in the ‘Nicolas Cage as bankable movie star’ career coffin. Summer’s Isle is a remote and isolated island populated only by a small group of fiercely private – and intensely nuts – locals. Nonetheless when cop on stress leave Edward Malus (Nic Cage) receives a letter from a long forgotten ex detailing a missing child, that’s exactly where he heads. Upon arriving Edward is met by a resentful group of mostly women. Women who upon laying eyes on Edward make expressions like they just detected a fart in the air, and women who treat Edward like he was the guy that dealt it. He sees crazy things. He speaks to oddballs, who despite talking in hushed tones still manage to babble ominous nonsense or deliver cryptic messages in a conspiratorial manner. He worries about the bees, because he is allergic, and because there are many bees. Apparently an hour is all it takes to justify an escalation of stupidity. After all the Harvest Festival is a comin’, the high point of the Summer’s Isle calendar. Anyone who has ever seen a YouTube clip has already borne witness to the only two moments of value in this film, both sound bites of Nicolas Cage overacting to buggery. One where Edward asks how something came to be somewhat singed, the other… About those aforementioned bees. So do yourself a favour. Instead of wasting one hundred and one minutes watching the largely unwatchable, check out this clip 101 times. Final Rating – 4 / 10. Edward Malus travels a long, long way to find his every effort to be worthless. That is the same outcome for the viewer. This entry was posted in B Movie Haiku Reviews, Crappy Movies, Film, Movie Reviews, Nic / Nicolas Cage, Superstars. Bookmark the permalink.